There are a lot of things I want to say on this blog, so I do apologize in advance for jumping a bit between subjects. I will shortly write the next installment of my data modeling series – but before that, I want to let you know about some exciting new tests that I am working on in my copious amount of spare time . An HP DL980G7 box with 8 Nehalem-EX CPU at 8 Cores each (16 in HT mode). Clock speed of 2.0 GHz. Along with Tom Scribner of FusionIO (one of the guys who wrote the FIO Windows driver) – I will be doing some tests on this monster box. This is one of the largest scale-up systems out there – and the biggest scale-up x64 box that HP currently ships. 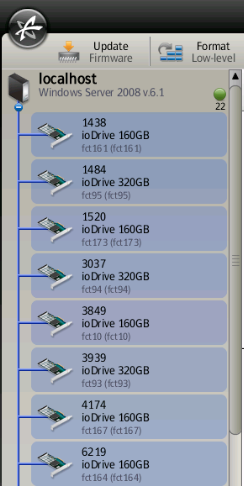 We still don’t know exactly how many IOPS we can squeeze out of this, but it is looking promising. You know you are heading the right way with your tuning, when both tuners are looking at 100K Random IOPS, at 64K blocks, consistent 0.6ms latency – and say: “Nice, but not impressive”. This is basically a system with no bottlenecks. Notice the little green light in the top right corner, with the number 22 next to it.That is the number of IODimms. Some of you may have participated in the “Crappy Code Games” during SQL Bits and seen some pretty amazing results. But now, I want to up the bar and try “Great Code Game”. I want to put SQL Server to the test and discover the grade of the steel of basic operations that we all need to do when designing databases. How many singleton INSERT / sec can this box sustain? How many single row UPDATE statements / sec can we do? How fast can you table scan fact tables? How fast can you do backup? Ad 2,3) This will of course depend a lot on the table design and file layout. If you have seen me present at SQLBits, you will know that I have some unorthodox design techniques to boost scale. I plan to put them through extreme testing and write more about them. For all you OLTP people out there – this is going to be important if you design for scale. Ad 4) I have no clue how fast this box will run for table scans. But I know that the PCI bus can do at least 36GB/sec. Ad 5) Again, I have no clue what the result will be and what bottlenecks I might hit. Only testing will show. I am quite confident that the standard “out of the box” designs you generally see recommended will not scale on this box. But I am equally confident that there are ways to break through the scale roof and shut up the voices that would claim that SQL Server does not scale. Be prepared for some surprising design hints. The box also has Hyper Threading (HT). Time allowing, I will see how well the claim that the new HT actually boosts scale will measure up to actual testing. Also, I know a lot of people have asked me about NAND devices and what can be done with them. Feel free to suggest ideas for tests in the comment section. Anyone else have a box like this out there? I challenge you to compete and explore with me. Tom,Thank you for writing this post. I went toghurh the same things you describe. I didn’t know anything about SQL Family and Twitter until a year ago. I had been working in my little cave.I emailed Andy Leonard asking for help on starting a blog. Andy pointed meto, the great Brent Ozar, as you say.I started following both their blogs, got on twitter, and started a blog. I don’t know if I can measure my achievements, but I know I’ve grown a lot both personally and professionally. I’m contributing very happy for that.Nothing would have been possible if it wasn’t for Brent and Andy. They have no idea of the impact they made on my career and my passion for SQL Server I want to join you in thanking them for their help.~Sam.